Volunteers are not only the heart of United Way of Greater Portland, they are the physical embodiment of our community at its best, helping to support long-lasting change and Thrive2027 goals. Throughout the week United Way of Greater Portland will be spotlighting incredible volunteers and organizations that are making our community thrive. Today’s spotlight focuses on literacy, furthering Thrive2027 Goal 1. 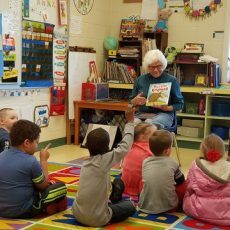 Residents from The Woods at Canco read with Kindergarten through 3rd classrooms at Canal School, and engaged students in discussion about the books. Mostly former educators themselves this opportunity aligned with their interests and fulfilled a community need. As a result of their visit, many of these folks are now volunteering on a regular basis. United Way of Greater Portland can connect you with one-time opportunities and events that help our community, tools for hosting a collection of needed items, as well as ongoing and regularly scheduled opportunities. Like This Opportunity? Sign Up Today! On Thursday, April 25 Volunteers will celebrate National Financial Literacy Month at Canal from 2 pm – 3 pm and at Saccarappa Elementary School from 9 am – 10 am in Westbrook. 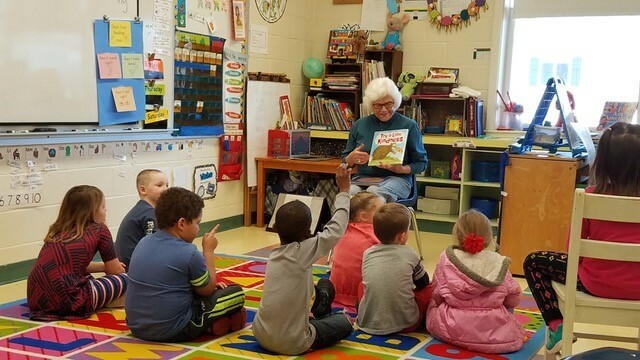 Volunteers will read a book to first graders and lead the class in a related activity. To sign up email volunteer@unitedwaygp.org.